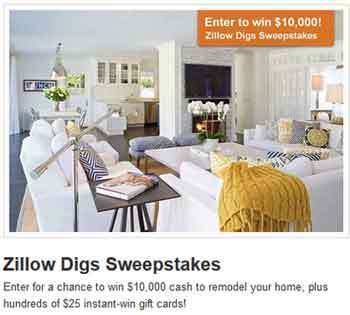 Zillow.com/Digs – The Zillow Digs Instant Win and Sweepstakes. Zillow.com the popular online real estate database website are sponsoring (Zillow Inc. Administrator) this new Instant Win Sweepstakes. Indeed, Zillow Digs Sweepstakes 2013 offer you the chance to win up to $10,000 in cash prize and Instant sweepstakes prizes. If you’re a resident of the United States and are aged 18 or over, you are eligilible to participate. No sales presentation, purchase or payment of any kind is necessary to enter or win the promotion. During the sweepstakes period eligible entrant must visit www.zillow.com/digs and follow the on-screen instructions to enter the Zillow Digs Instant Win and Sweepstakes. To register, you will have to use or create a Zillow account, you may follow the prompts from the Zillow Digs page to create one. Entrant using tablets or mobile phone are inviting to use their Zillow’s App. Instant Prizes(200):Two Hundred (200) Instant Winners will each receive one (1) $25 Lowe’s Gift Card.